Dan Ritacco sent in this shot. "The attached photo was taken after our Grand Finals performance in Denver this past summer. 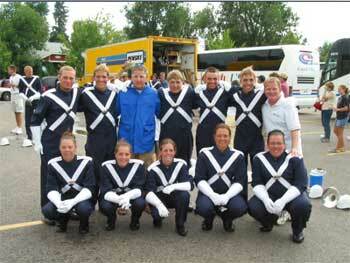 Pictured is the 2004 Blue Stars mellophone line along with Dave (visual mello tech) and me-- Tacco (musical mello tech)! It was a great pleasure to teach this very talented group of young people and I cannot wait to see what 2005 holds for the Blue Stars! "Pictured are (top row/left to right) Doug Hall (horn sergeant and only mello age-out! ), Ryan Olsen, Dave Hulburt (visual tech), Richie Shockley, Matt Gaunitz, Tyler Shipe and me! "Kneeling from left to right are Robym Brody, Betsy Mraz, Miranda Soucie, Rachel Traczyk and Valerie Glasscock."